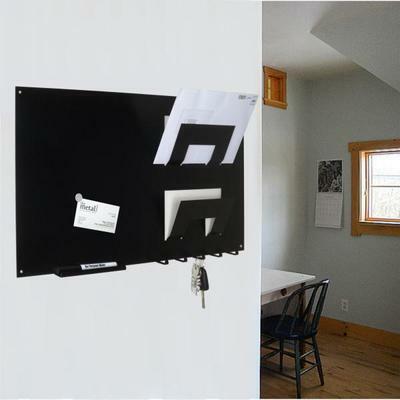 If you have a need for storage in the home or office this high quality magnetic memo board, letter rack and key holder will complement any environment. Its compact but practical design has the 3 in 1 storage solution everybody has been trying to find. The 2 letter holders can accommodate various size letters in its stylish compartments. The 5 key hooks make easy access to the household or office keys. The memo board area is magnetic and can also be used as a dry wipe board for all those important reminders. The Shelf will accommodate pens, markers and mobile phones. Manufactured in Steel and Powder Coated Black. Dimensions 60cm x 33cm x 7cm deep. Supplied with Fixings. This item is sold and dispatched directly by The Metal House. Based in the Cotswolds, The Metal House is an independent, family-run manufacturer and retailer of quirky office and home accessories. Its designs combine ingenuity and attention to detail, whilst representing great value for money.